A reliable derivation of deformation information from our B-mode imaging requires adequate (good) image quality. 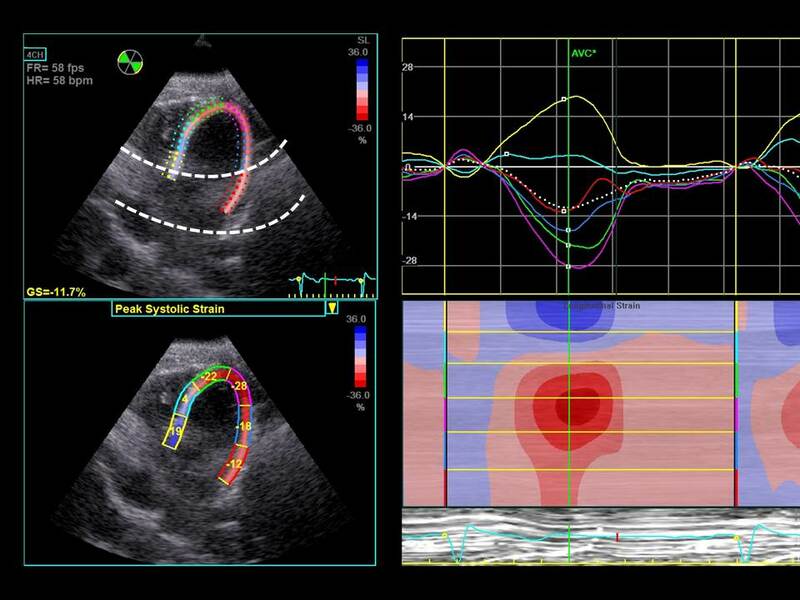 Echocardiographic images are often prone to artefacts and/or inadequate acoustic windows. Bad image quality will give bad and unreliable deformation graphs. A thorough knowledge of specific artefact will prevent misinterpretation of noise as abnormal deformation. A selection of frequently encountered artefacts with examples are provided below. A explained in the section of “reading the deformation graph”, the strain value at the onset point is 0%. The strain value at the end of the cardiac cycle (i.e. the onset of the next QRS complex) is also 0%. Form a physiological point of view, the size of the region of interest is approximately identical at the start of the next cardiac cycle. If note, the heart would shrink or expand, which is not the case. The best way to correct for these artefacts lies in the acquisition of optimal echocardiographic images. Sometimes it is possible to adjust the ROI to optimize tracking (adjusting the thickness or curvature of the ROI), although this often proves unsatisfactory. There is no consensus on the amount of drift which would result in excluding the segment from analysis. Drift compensation in the left figure and disabled in the right. Note how the different curves divert at the end of the cardiac cycle. This has influence on the peak values (example is the peak value of the green curve which is reduced from – 23% to -18%) and on the timing of peak values (note the peak strain after the AVC in the left and on the AVC on the right. Drop out is directly related to the echocardiographic image quality. In case of poor acoustic windows or due to acoustic shadowing, the myocardium is insufficiently visualized. This result in a too small number of myocardial speckles for the tracking algorithm. This consequently leads to an attenuated graph (velocity, strain, SR). One should critically check the tracking quality in case of poor image quality. The reduced peak strain value is most likely not a result of actual myocardial dysfunction. On the other hand, most software algorithms implement a normalisation to some order of degree, see below. This could give the suggestion of adequate tracking while there is none. The absence of signal in the entire anterior wall results in abnormal strain patterns and values. The basal and mid segment shown no deformation, the pink apical segment seems normal (with reduced peak strain values), but this is the result of a combination off normal tracking and drop-out, resulting in a “mean” curve, which should be discarded in this case. 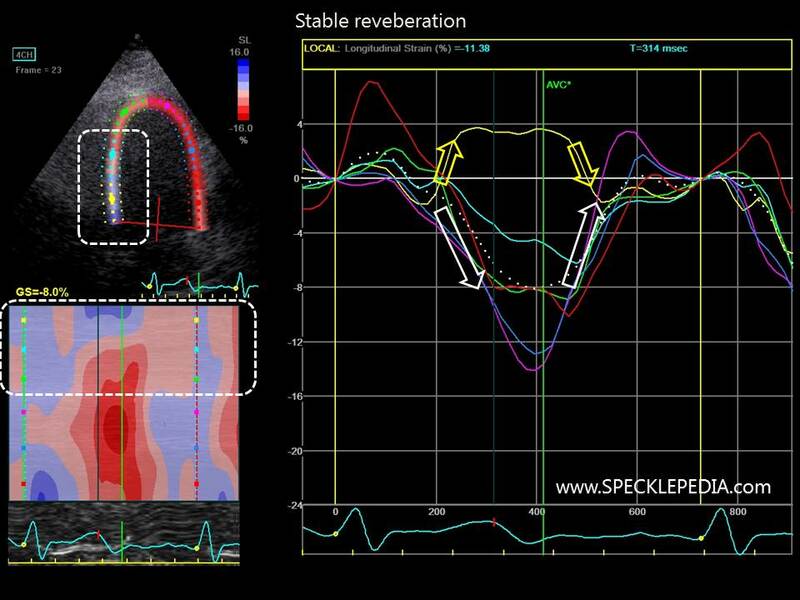 Both stable reverberations as well as side lobes provide a region where there are speckles which remain stable throughout the cardiac cycle. Since speckles generated by the myocardium and these artefacts are identical, the tracking algorithm will preferentially “track” the reverberation when this exceeds the brightness of the myocardium. This will consequently result in an absence of deformation at the site of the artefact, an excessive deformation distal to the artefact and a diminished or even reversed deformation proximal to the artefact. Speckle tracking by B-mode images uses 2 dimensional images to derive a three dimensional deformation. In the long axis views, torsion/twist will result in a motion of acoustic reflectors (i.e. speckles) through the imaging plane during contraction and relaxation. There is no way to compensate for this. 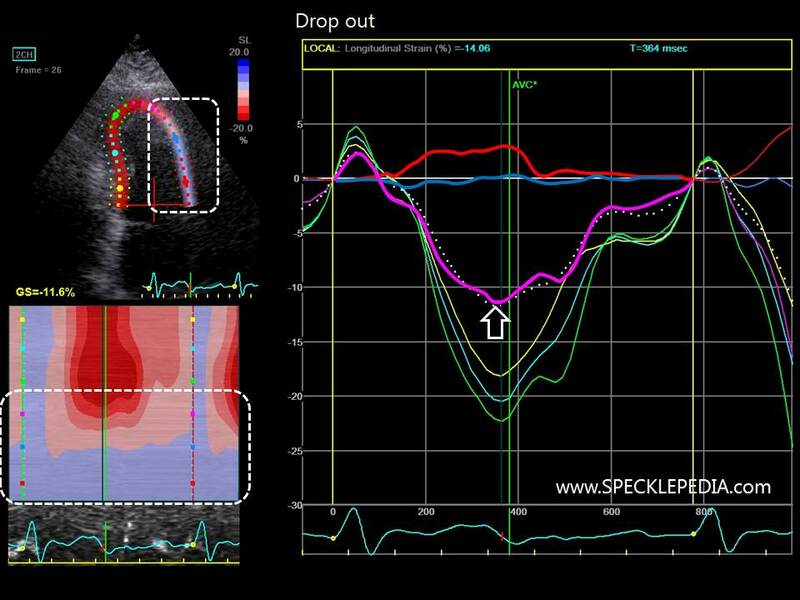 Most tracking algorithm use “new” speckles which appear in the ROI during the cardiac cycle in the tracking. In the short axis vies, the longitudinal shortening will result in the same phenomenon. This is often problematic in the basal short axis view (at the level of the mitral valve). During systole, the posterior mitral annulus will appear in the short axis view. This will severely affect the measurement of radial and circumferential strain. 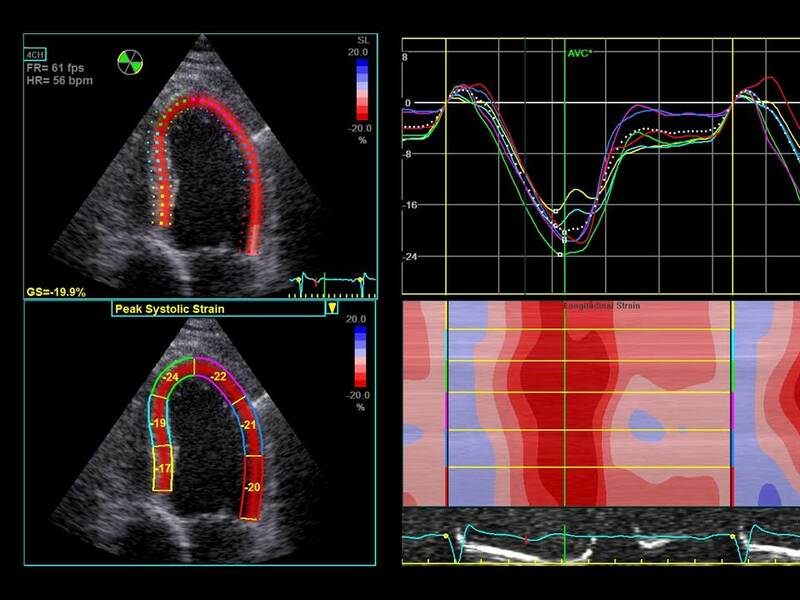 The best way to avoid this is by tilting the transducer slightly toward the apex until there is only myocardium seen throughout the entire systolic period. As the ultrasound travels deeper in the tissue, the ultrasound beam diverges. This consequently results in a reduction of lateral resolution in the deeper parts of the image sector (of note, the axial resolution is a product of the ultrasound frequency and is unaffected by travel distance). Typically, the reduced lateral resolution will result in poor tracking in the inferoposterior region in the short axis (circumferential strain) and in the basal segment in the posterior wall. The latter is explained by the “overspill” of the pericardium to the myocardium. Since the pericardium is not deforming, the deformation graph will be affected accordingly. This problem is resolved by placing the ultrasound focus at a greater depth and by repositioning the transducer. The different tracking algorithms by the different vendors all apply, to some degree, a normalisation. The precise mechanism and the amount of normalisation is unknown (and typically referred to as the “black box” of speckle tracking). This phenomenon is clearly appreciated by placing the ROI at a random spot within the ultrasound image. This often results in “normal” deformation graphs, while there should be none. Whether this poses a real problem is unknown. There is generally good agreement between speckle tracking derived strain and tissue Doppler strain / CMR strain / sonomicrometry. One should be aware of this in case of poor image quality.